Looking across the platform at Shinjuku station, from a train on the Chūō-Sōbu Line to a packed train on the Yamanote Line. 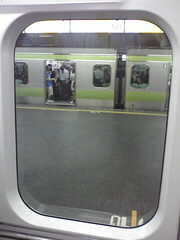 This entry was posted in Photos, Travel and tagged Japan, JR East, Tokyo, train, trains. Bookmark the permalink.